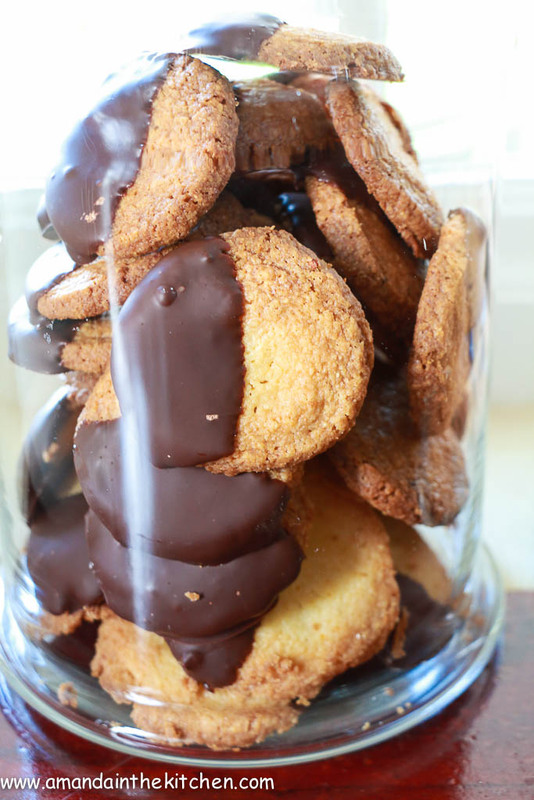 A buttery, crumbly orange flavoured shortbread dipped in dark chocolate. It is not a very sticky dough as it has enough butter to keep it from being difficult, but it is a very soft dough. Wrap and roll the dough up into a tight sausage in clingfilm. Some of you may not know how to do this: Very simply take a large piece of clingfilm and lay it on your work surface. Take the dough and shape it in your hands into a fat sausage and lay onto the bottom edge of the clingfilm, the edge closest to you. Make sure you have at least 5cm of clingfilm on each side of the dough. Take the bottom edge of the clingfilm and lay it over the dough and continue to roll until all the clingfilm is on the dough. Take the edge pieces and use those as handles to roll the dough up tighter and get a nice uniform shape. Put the sausages of dough into the freezer for an hour to freeze. The frozen dough is very easy to deal with. Slice into rounds with the clingfilm on using a very sharp knife. 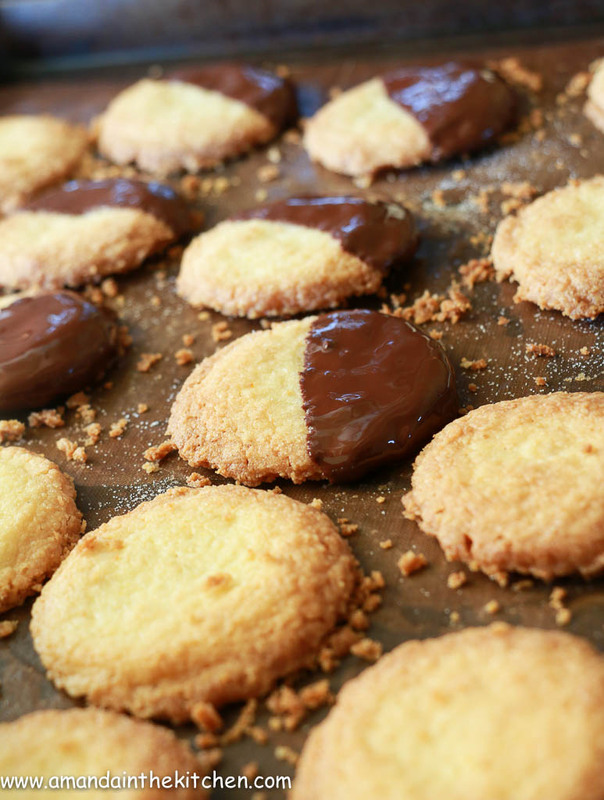 Once cut remove the clingfilm from each biscuit and lay on a baking tray. Allow the dough to rest for a few minutes and warm up a little before popping in the oven. Bake for 10-15 minutes until golden brown. 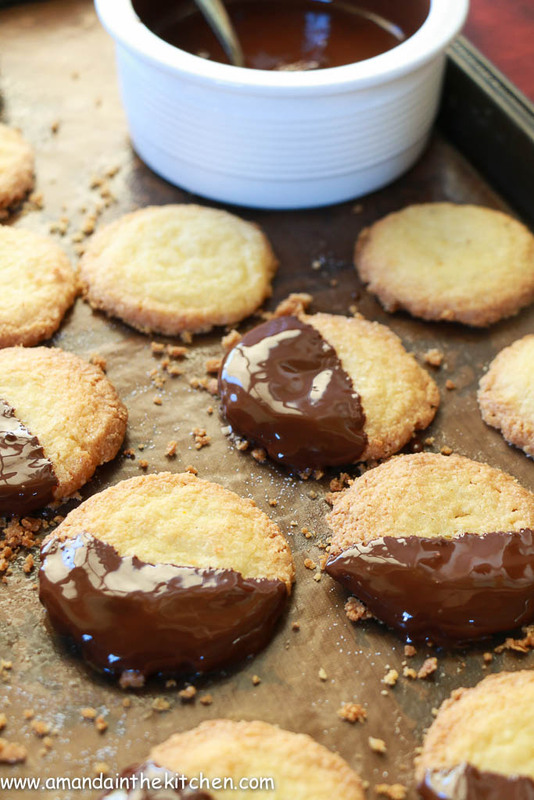 Once cooled dip one end of each biscuit into the melted dark chocolate and allow the chocolate to set. The flavour of orange and chocolate in a biscuit is amazing!